Can you believe it’s Super Bowl weekend already? Man, it seems like football season flew by faster than a pass from Matt Stafford. Whether Super Bowl LI finds you cheering for Atlanta or New England, there is always one part of the experience that brings both sides together. 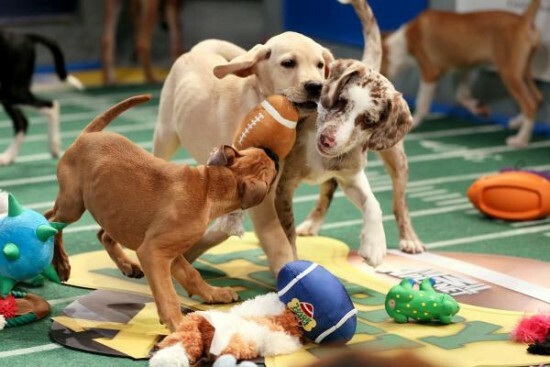 The 13th annual Puppy Bowl. You thought I was going to say the commercials, didn’t you? Well, we’ll get to those in just a minute. But first, the “biggest game in adoption” and quite possibly a better predictor of the actual game than many of the so-called experts. The starting lineup for Team Fluff includes Alexander Hamilpup, Peanut and Stretch. Team Ruff, on the other hand, has Beebop, Puddles and Squirt to tackle any challenge that comes their way. Together, Team Fluff and Team Ruff are comprised of 39 puppies from 34 different animal shelters stretching across 22 states. With a special appearance by Punxsutawney Phil, chinchilla mascots and the Kitty Half-Time Show, this precursor to Super Bowl LI may be three hours of cuteness that will have you dialing up the local shelter. Tune in to Animal Planet at 2 p.m. ET/11 a.m. PT for pregame, with kickoff scheduled for 3 p.m. ET/12 p.m. PT. You can also “meet” the players by visiting AnimalPlanet.com. As with years past, some were leaked early and of course I’ve viewed all of them in HOPES that this will be the year FCA US lets the cat out of the bag. No such luck. From burgers to brews and tech to Tums, this year’s sneak peeks cover a lot of ground, but did not turn up so much as a hint from FCA US. So, here are my predictions – FCA US will air two (maybe three, if we’re lucky) epic commercials that will speak to the hearts of football fans (and non-fans) everywhere. Finally, regarding the game (you know, that thing you watch after the Puppy Bowl and between commercials), I’m going to withhold any prediction/opinion as I live with two die-hard Patriots fans and I like a peaceful household. Go (insert your team here)! May the best team win!